While you might be tempted to skip lunch and pour yourself another cup of coffee instead, skipping lunch can result in negative effects on your digestive system, sleep schedule, and exercise performance. Having a busy day at the office? Trying to save money? Whatever your reason is, here are three reasons why you shouldn’t skip your lunch break. Contrary to popular belief, skipping meals isn’t an effective solution to weight loss. In fact, it can actually lead to more food cravings and binge-eating – ultimately resulting in weight gain. Instead, eat regularly to help control your appetite and maintain a higher metabolic rate. 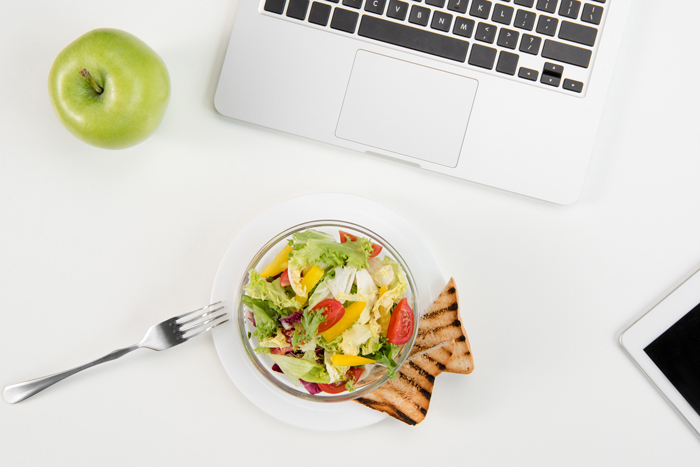 Your body’s serotonin levels are affected by how and what you eat, which is why skipping lunch can leave you feeling grouchy, tired, and unproductive. If you’re having a busy day, grab a piece of fruit and a protein-rich snack like a hard-boiled egg, Greek yogurt, or a handful of nuts. It’s simple — it’s hard to work or sleep when you’re hungry. To keep your body and brain alert, avoid feeling sluggish, and optimize work productivity, consume healthy foods that are high in protein, fiber, and complex carbs. Are you going dairy-free this year? Check out the difference between all the dairy-free milk alternatives. How Much Kombucha Is Too Much Kombucha?